On this page, we show you the students' views on Easter and Easter traditions as reflected in contributions to our Facebook project discussion forum. There is also a page on Easter traditions around the world, written by students from the school at Darlington (UK). 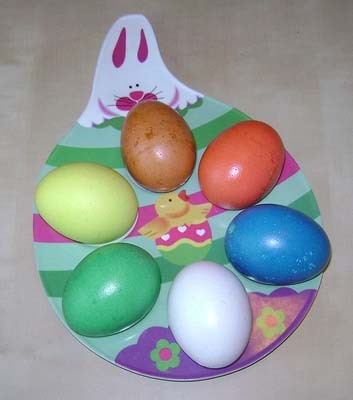 Source: http://commons.wikimedia.org/wiki/File:Easter_2010,_d.JPG. Copyright: see that page. In the forum, the question was: What do you do at Easter? Is Easter just about eating chocolate? "Easter is about so much more than eating chocolate! It is a time for going to church and learning all about what happened when Jesus died and then rose again on the cross." "I think Easter is a time to go to church (because I do!) and remember that Jesus rose from the dead. It is a time for celebration." " I think that Easter is a time to remember that Jesus rose from the dead. It is not just about eating chocolate. At Easter we get together as a family and have a good time. This is what Easter is all about for me :-)." "I dont do a lot at Easter. I normally watch tv, maybe go to church and I eat lots of chocolate. I dont think that it is just about chocolate but I enjoy it anyway!!! :-)"
"4 years ago my parents hid chocolate and Easter eggs in the house or in good weather in the garden and I looked for them. We often are on holidays at Easter. Now we have breakfast together. After that I get my chocolate and Easter eggs." "Although I don’t do things like going to church, I don’t think Easter is just about eating chocolate. It’s an important festival for Christians, so you should at least think a bit about his resurrection. I celebrate this festival with my family at my aunt’s house, with having a brunch." "I don’t celebrate this festival so much, because I’m not religious. At Easter we all like eating chocolate but we also do think about Jesus Christ." "I like Easter, it´s one of my favorite festivals. My family is not very religious but I am. But it is not a big problem for me. I usually go to the church on the Easter Sunday (I help with the children´s service). It is very funny how our minister is trying to hide the presents he gives us every year but I always find them in less than 5 minutes. Then my family and me go to my grandma to eat cake and chocolate. By the way, I think Easter isn't just about eating chocolate (because I'm a Christian this maybe sounds a little bit cliché), its about how Jesus rose. Some Christians even think Easter is more important than Christmas. "I'm everything else than religious!! I don't go to church (but I live very next to one), I don't pray, and I don't believe in God. My Granny still wants us to search for eggs and sweets (especially for my cousins) but it hasn't just a religious meaning for her. We don't get only the sweets, we also get bigger presents, which is veeerryy useful because you could get presents 4 times a year. =)"
"On Easter we (me, my sister, my brother) used to search in the garden for chocolate, directly after we woke up. But we don’t do this anymore, it’s for little kids, you know! So for a few years now , we have had the tradition to eat cake at grandmother's house on Easter Saturday and to eat Chinese food at my aunt's house on Easter Sunday. Sometimes on Easter Sunday my other Grandmother had her birthday and it was nice because she was always happy at Easter. My Grandmother was a diabetic , so she always checked her blood sugar. She always made sure that it was low but not too low, so she could eat cake and chocolate. She died nearly a year ago and Easter was very sad this year. I think at Easter what the bible says is still important, but not for everyone. My family (for example) is not really religious (my sister is very religious). I mean we are all Christians, but we don’t go to church." "Easter is a day where the parents hide Easter eggs and let the kids search for them. The parents hide them behind the pillow or on the window sill. But when the kids are older than 12 years some parents don’t do that anymore. The kids don’t know that the Easter rabbit isn’t real." L. & L. (girls), Mülheim. "Easter is not so special like Christmas but we get a small present and go to church. After church we eat a big lunch." "At Easter I do nothing special; maybe I eat cakes with my family and drink coffee. The reason for that is that we are not so religious that we do any special things there." "In Germanyy we manly get a little money and sweets and come together with the family but not everywhere." "We eat some traditional Polish Easter dishes, spend some time with our family, go to church ..."
"ohh yea we also go to church too :)"
"In Spain we participate in processions through the streets of the city and buy the "mona", which is a buiscuit with an egg in the middle, and we go to the countryside or to the beach with your friends or family." "In England we buy each other little chocolate eggs as gifts. :)"